Chart Wealth... Internet Sector Stocks Break-Out! December 2005, Volume 2 Issue 12 Know It - Profit! Internet sector stocks have broken-out to new four-year highs. Will the increase in online activities continue to support the Internet sector? Find out which online stalwart is positioned to move higher. The Nasdaq Composite (^IXIC) is now outperforming the Dow Jones Industrials and the Standard & Poor's 500. Up seven percent for the year, the Nasdaq is now poised to catch the Russell 2000. The CBOE GSTI Internet Index (^GIN) has cruised to a 267 percent gain since its low in October 2002. The gradual rise in value was barely perceptible... lending credibility to an often criticized speculative sector. 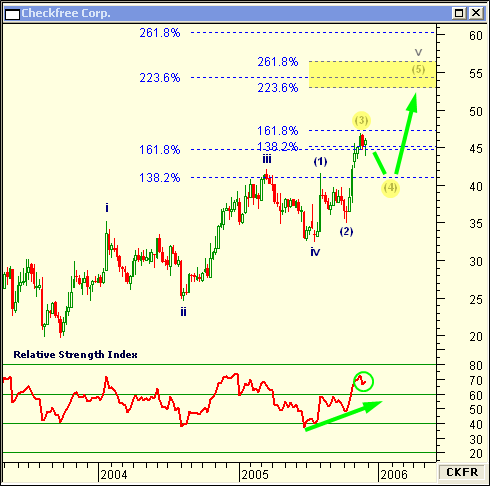 CKFR appears to be putting in a minor wave (3) inside a larger wave v on the weekly chart. Both waves (5) and v look like they will terminate in an area of Fibonacci confluence in the $53 to $57 price range. The relative strength index is showing no signs of divergence or weakness. Look for some brief corrective congestion before CKFR continues it ride up. In the July issue of Chart Wealth, I said Vertex Pharmaceuticals Inc. (VRTX) would reach a price target range of $22 to $24. As we move into the holiday season, some stocks will go on vacation just like the investors who trade them. Thinly traded markets and low volume can make for unexpected price movements. If a stock begins to trade erratically, it may be better to step aside than ride-out the bumpy price action.